Learn what kind of registration analytics data you have access to and how to export it. To access this information simply go to the Analytics > Ticket Analytics section on your dashboard. You can request a detailed Orders, Badges, Guestlist and Attendee report in xlsx or CSV format to be sent to your email address. Order Report - includes detailed info about each order, like date, purchaser name and email, number of tickets purchased, discount and discount/unlock code applied (if there was one set up), fees, etc. Badges Report - includes barcodes for each attendee that you can convert into QR codes to print them on badges. Your check-in staff will be able to scan those QR codes with the Arrival app. Guestlist Report - simply includes attendees' names and the name of the ticket they've purchased. 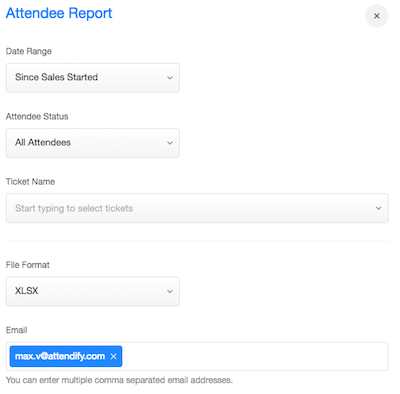 Attendee Report - this one includes all the registration data, including custom fields from your custom checkout forms. 4. Select the type of the ticket(s) you'd like to receive the report for, choose the format of the report and click Request. For the Orders Report you can also select the Date Range and Order Type.